One thing about me.. I love music. Mostly hip hop, r&b, house, dance music.. But I’ve been known to listen to Florence and the Machines from track one to the end because I can get down with that too. But not like I can get down with that new Justin Timberlake.. I think I’ve listened to his album until I can’t listen to it anymore and it has me running out looking for some Strawberry Bubblegum. If you are reading this thinking Erika, what the hell.. sorry .. He is currently singing to me as I type this post , while sitting here ignoring a conference call for work that I guess I should be listening to but will find out what they need me to do later. 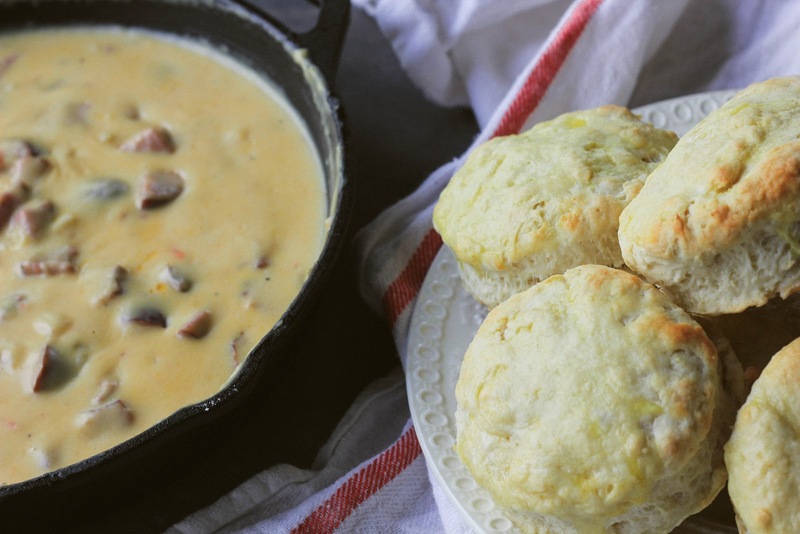 In the meantime.. I’ve got something good for you folks today..
Something fresh and healthy.. clean eating friendly..
What I’ve got for you today is Buttermilk Biscuits, smothered in Cajun Sausage Gravy. Because when you’re trying to get in shape for summer while paying a personal trainer too much money to torture you..
Or it is if you're me..
Biscuits were the first thing that I learned how to make.. my grandmother owns a restaurant and in the summer when most kids were at the pool, catching frogs or just doing things that kids should be doing. I got to work in the back of a hot kitchen with flour, shortening a rolling pin and an attitude.. I appreciate it now because I realize that I learned from the best at 7 years old and can now make a batch of biscuits with my eyes closed. Now learning that I can’t eat them as often as I did when I was 7 is something that I am currently struggling with, hence the aforementioned expensive personal trainer. For the biscuits- Preheat oven to 450. In a large bowl stir together flours, baking powder, sugar, salt, and cream of tartar. Using a pastry blender, cut in butter and shortening until mixture resembles coarse crumbs. 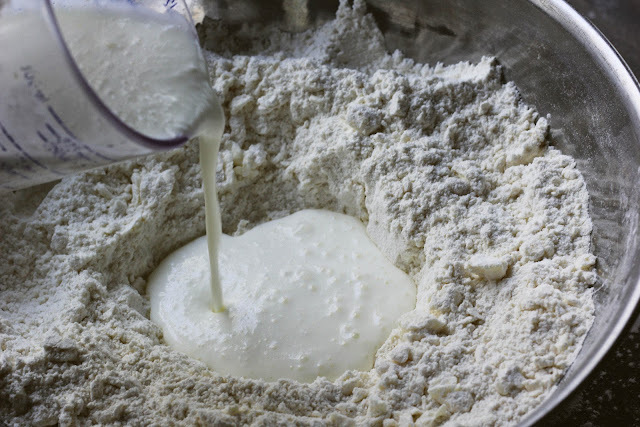 Make a well in the middle of the flour mixture and pour in buttermilk. Using a fork stir together until moistened. 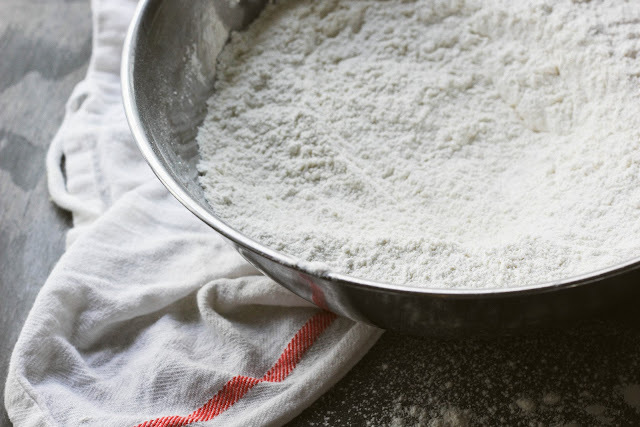 Turn dough out onto a lightly floured surface. 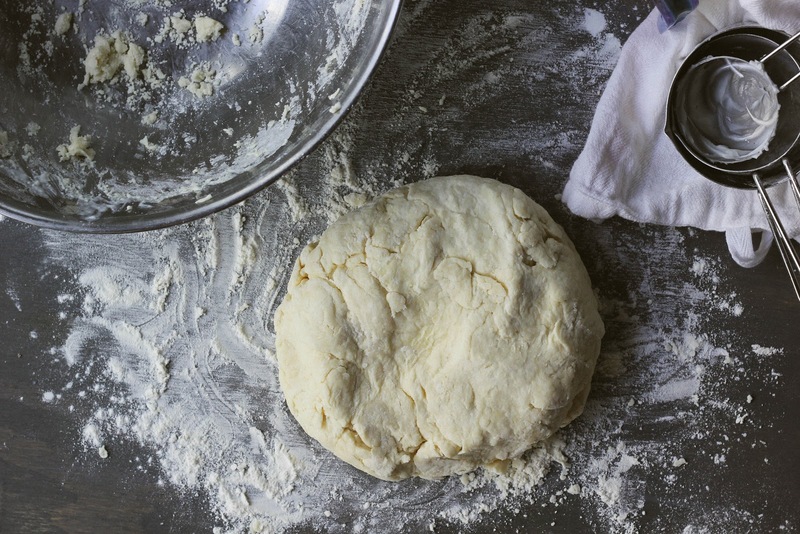 Knead the dough by folding and pressing until the dough holds together. Pat or lightly roll the dough out to about 1 1/4 inches. Cut dough into rounds using a biscuit cutter or in my case a floured glass cup. Place rounds onto an ungreased baking sheet. 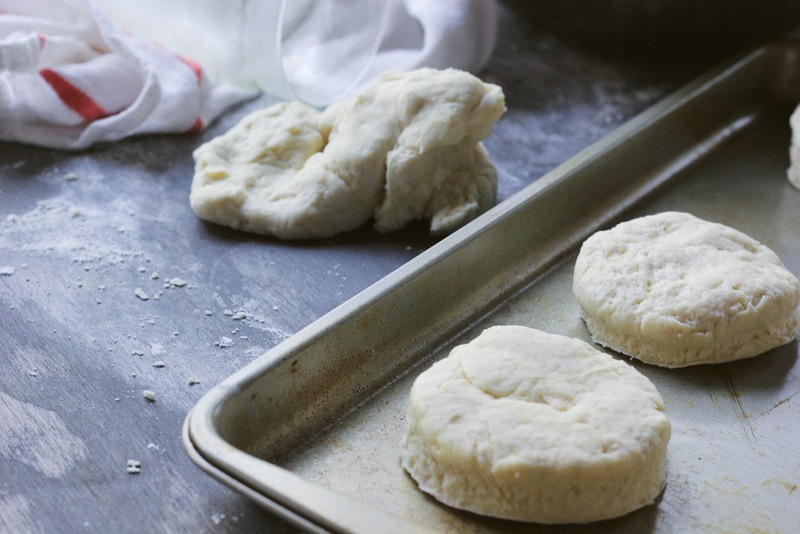 Bake for 12-15 minutes or until biscuits are golden brown. 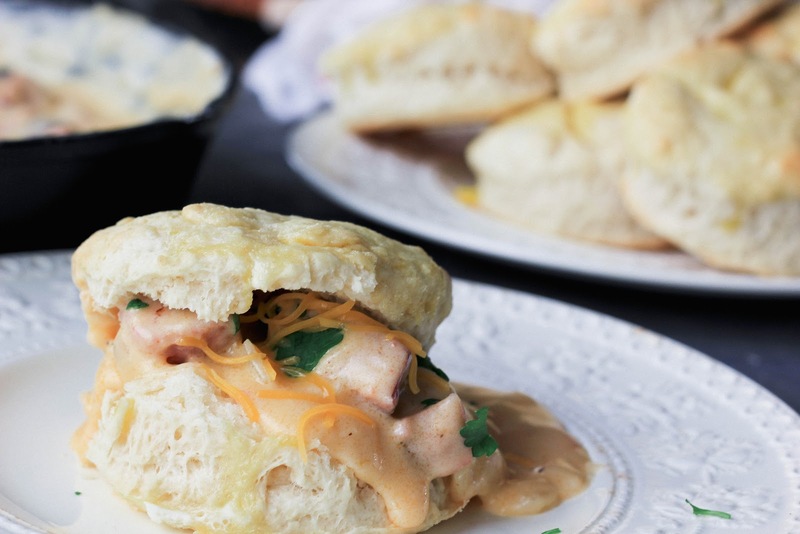 While the biscuits are cooking, make the gravy. In a large skillet, over medium heat.. melt the 1/4 cup of butter. Add sausage, onion, and sweet pepper cooking for about 5 minutes or until vegetables are tender. Stir in paprika and garlic powder; Add 1/4 cup of flour to the mixture, stir well. 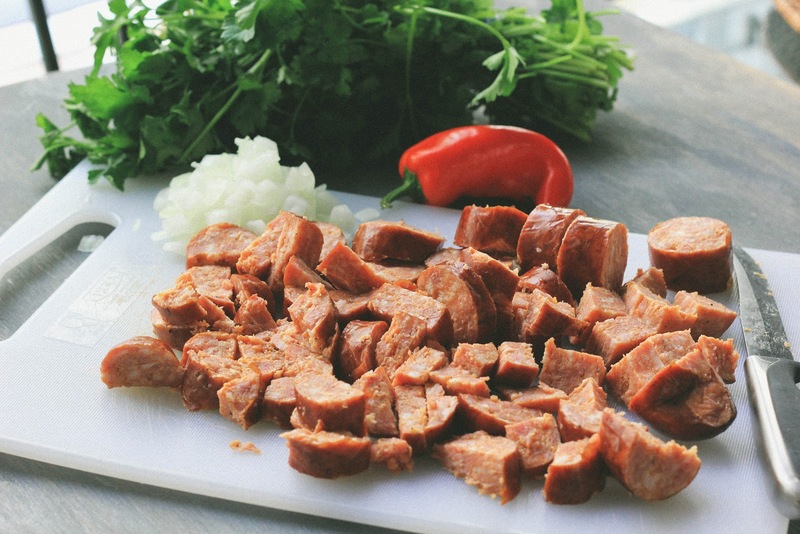 Let the flour cook with the sausage mixture for about one minute while stirring constantly. Gradually pour in milk; cook and stir until thickened and bubbly. Remove biscuits from the oven and allow to cool slightly. To serve, split the biscuits, spoon gravy over split biscuits and top with parsley and a little shredded cheddar over each biscuit.